Barbets are found in greatest numbers and diversity in tropical Africa; in the Americas they are fewer in species and have a surprisingly restricted range. Asian barbets are also less varied than the African ones. The 15 American barbets are mostly lowland birds of the Amazon basin; only three extend into Central America, in marked contrast with the related toucans. Few spread south of the Amazon and, unlike toucans, there are no southern barbets, and few that live in montane forest. Barbets occupy most of Africa south of the Sahara, from the Atlantic to Ethiopia and south to South Africa. In Africa, barbets appear to have evolved during a long period of changing forest cover. As vast forests became split into discrete areas, so populations of barbets were isolated. These groups, over time, developed into separate species as forest areas re mained apart, each beyond the reach of weak-flying barbets from other forest refuges. This characteristic of ever-changing habitat also forced some barbets to occupy drier, bushy places outside proper forest cover, not seen in barbets elsewhere except in recent habitats such as orchards and towns where conditions have quite incidentally been made acceptable to fruit-eating forest birds. Tropical Asian barbets are less well studied than the others. Five species live in peninsular India, four in Sri Lanka, and five or six in northern India and Nepal, but Southeast Asia has a greater variety. Sumatra has eight species, Java six, and Borneo nine; in all, 21 of 26 Asian barbets are in Southeast Asia. This variety within a spectacular family is wonderful, but its future is surely bleak as forest cover is being destroyed at an unprecedented (and still accelerating) rate. 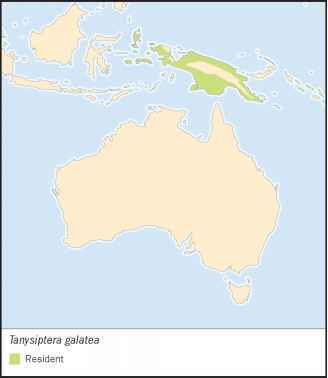 No barbets are found east of Wallace's Line or in Sulawesi: no islands east of Bali have barbets.